That's the last pun, we promise. Capital Pride kicks off Thursday, June 2, launching nearly two weeks of happy hours, pride events, fitness op, and more -- think music, shopping, fundraisers and the capstone Pride Parade next Saturday, June 11. Mr. & Ms. Capital Pride Pageant -- June 4, 6-10 p.m. at Town Danceboutique (2009 8th St. N.W.). You can enter for $50 or just head out for a night of fun to see who's awarded the crowns. Say I Do! LGBT Wedding Expo -- June 5, 1-4 p.m. at Hotel Palomar (2121 P St. N.W.). Find LGBT-friendly wedding planners, florists, photogs and more. Admission $7 singles; $10 couples. Order tix here. 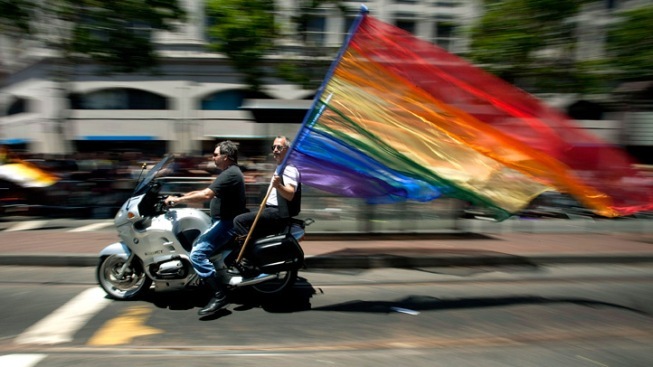 The 35th annual Capital Pride Parade will march through Dupont Circle Saturday evening. D.C. Latino Pride -- June 10, 6-9 p.m. at Town Danceboutique (2009 8th St. N.W.). The reception includes networking ops, hors d'oeuvres, a historical exhibit, a panel discussion on marriage equality and more. Presented by the Latino GLBT History Project. $5 suggested donation; cash bar. Divas Outdoors: Classic Films Under the Stars -- June 10, 8:30-10:30 p.m. at Hillwood Estate, Museum & Gardens (4155 Linnean Ave. N.W.) Go for a screening of "Desk Set" (1957) starring Katherine Hepburn, Spencer Tracy and Dina Merrill, chronicling the clashes around the computerization of their TV network's research department. The scandal! The intrigue! Planners say: "Bring your best spread for our picnic competition. Winners receive copies of the film, signed by Dina Merrill." $15 admission. Capital Pride Parade -- June 11, 5:30-8:30 p.m. The annual parade will make its way through Dupont and Logan circles, kicking off from 22nd and P and finishing at N and 14. Parade awards will include Most Outrageous (the Liberace Award), Best Walking (Nancy Sinatra Award) and the Best Incorporation of a Theme (Lady Gaga Award). See the parade map here. 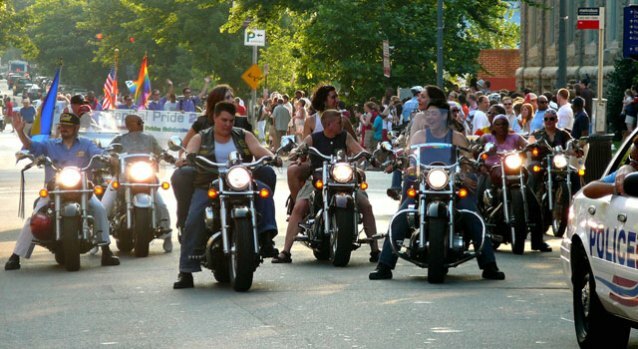 Capital Pride Festival -- June 12, 11 a.m.-6 p.m. on Pennsylvania Avenue N.W. The day includes live music from 25+ performers, including the D.C. Gay Mens' Chorus and Jennifer Holliday. Free admission; $5 encouraged donation.